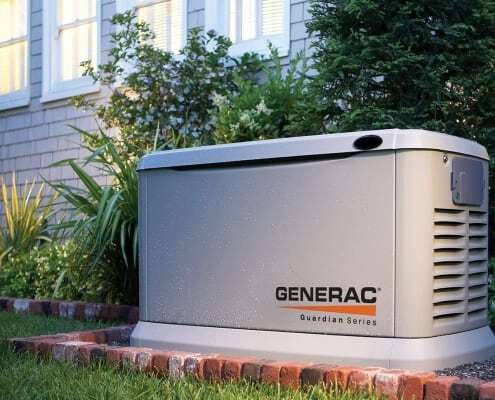 Wondering about getting a backup standby generator in Dover NH or the surrounding areas? Need an exceptional team of pros to perform the installation for you? LaPlante IS THAT TEAM! We primarily work in the Southern Maine and Seacoast NH area and can handle everything from the quote, to site visit, to installation, financing, and service after you purchase your generator. You will be thrilled with the service you receive from LaPlante, just like all of our other NH generator customers! Not only will we install and build the base for your standby generator, but we’ll also obtain the necessary permits and refer you to local contractors who can help you dig the necessary trench to complete the installation. LAPLANTE ELECTRIC WILL HANDLE YOUR SEACOAST NH HOME GENERATOR INSTALLATION! No need to worry about filling your portable generator anymore! And definitely no need to worry about nasty winter storms and power outages. Getting a standby generator in NH is the only way to go. Forget cringing with nervousness when the weather meteorologist calls for snow and sleet… you’ve got it covered!